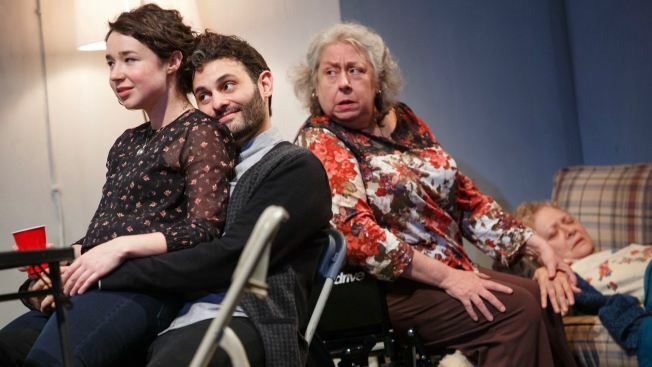 Brigid and Richard (Sarah Steele and Arian Moayed) share a moment, while Deirdre (Jayne Houdyshell) looks on. On the sofa, "Momo" (Lauren Klein), in the last throes of dementia, sleeps off her medication. I had bad dreams after returning from Stephen Karam’s “The Humans,” which has just opened at the Laura Pels Theatre. A concise drama about one family’s difficult Thanksgiving dinner—kudos to Roundabout for the opportunistic timing!—I could feel my nerves fraying minutes into the performance. Cockroaches. Thumping, from zombie-like upstairs neighbors. Groaning trash compactors. These jolts, mere bumps in the night to some, punctuate the dialogue in Karam’s despairing story—a plot that even in its sedate moments explores dementia, ulcerative colitis, a crippling affair, body image and poverty. The two men in Karam’s drama—a father who has traveled to New York to celebrate the holiday with his daughter in her Chinatown pre-war dump-plex, and the daughter’s older beau, a grad student ticking off the days until he can collect his trust fund—are also plagued by nightmares as “The Humans” unfolds. Richard (Arian Moayed, a Tony nominee for “Bengal Tiger…”), the boyfriend, tries to intellectualize his way out of fear, explaining it as a matter of perspective. He’s obsessed with a comic book, in which half-demon creatures with teeth on their backs tell each other horror stories … about scary humans (ergo, Karam’s title). Meanwhile, father Erik (Reed Birney, the marvelous character actor, recently seen in “House of Cards,” etc. ), emboldened by liquor, reveals specifics of his sweat-filled nights: They involve a woman, whose eyes and mouth are covered by skin. “The Humans” is not at all cryptic as to why this stand-up fellow, for decades a maintenance worker at a Scranton Catholic school, is such a disheveled mess. Erik has traveled to the city with his wife (Jayne Houdyshell, in care package-making, full-throttle suburban-mom mode) and older daughter (Cassie Beck), to celebrate the holiday with daughter No. 2 (Sarah Steele, of “The Good Wife”), who is newly co-habitating with Richard. Erik’s ailing mother, “Momo” (Lauren Klein), has also made the trip. It’s four years since “Momo" has recognized her granddaughters, but an unexpected moment before dinner snaps her briefly back to coherence. It brings joy to her son, daughter-in-law and grandchildren, but it’s one of only a few things that will go well this evening. Facades are quickly dropped, and miseries laid bare for all to see. Beck, as an ailing lawyer, was particularly effective in a scene that has her making an unwise phone call to an ex-girlfriend. And amid the escalating stresses of the night, Klein has a guttural outburst that, if you’ve ever spent time around someone with dementia, will ring horribly and effectively true. I loved these performances, and the ways the characters were trying to stumble through lives haunted by an array of tribulations. Ditto for the piercing script by Pulitzer Prize-finalist Karam (“Sons of the Prophet”), in spite of a 9/11 storyline that seemed unnecessary. Gracefully directed by Joe Mantello, “The Humans” takes place in one real-time scene on a two-level, four-room set. To the audience, it looks like a dollhouse, except the joists and plaster walls are exposed, as if they’ve been cut through with a circular saw. That rawness extends to the characters on stage, as well. I watched the final scenes peeking through my fingers, as if at a Freddy Krueger movie, and not a meticulously crafted drama about fear and the complicated ways we drop our guard when encircled by family. “The Humans,” through Dec. 27 at the Laura Pels Theatre, 111 W. 46th St. Tickets: $79. Call 212-719-1300.